Janet Napolitano helped craft the Deferred Action for Childhood Arrivals program. This story was updated on Feb. 21. When Janet Napolitano was named president of the University of California over three years ago, her appointment provoked impassioned protests by students and others upset about her role as head of the Department of Homeland Security overseeing the deportation of more than 2.5 million undocumented immigrants. At the July 2013 board of regents meeting when she was selected to the position, protesters brandishing signs like “Undocumented is not a crime, Napolitano, it’s not your time” briefly shut down the proceedings. Student regent Cinthia Flores, the only dissenting vote against her on the board, said Napolitano’s background in immigration enforcement would “cast a long shadow on her future endeavors” at the university. Fast forward to today. Napolitano has emerged as one of the leading defenders of the Deferred Action for Childhood Arrivals program, which at least for now President Trump appears to have spared, despite vowing during the presidential campaign to rescind it. The program has provided temporary relief from deportation to three-quarters of a million undocumented immigrants who came to the United States as children, including many attending the University of California. Students who once opposed Napolitano now welcome her support. “I am happy and appreciative that the president of the university system is responding to the needs of undocumented students at this unique time in history,” said Flores, who directs the Dream Resource Center at UCLA’s Labor Center, offering a range of programs on behalf of immigrant students. Napolitano is certainly the most prominent higher education leader in the nation to be identified with the issue. That was perhaps inevitable given Napolitano’s central role in implementing the DACA program in 2012 when she was Secretary of Homeland Security in the Obama administration. 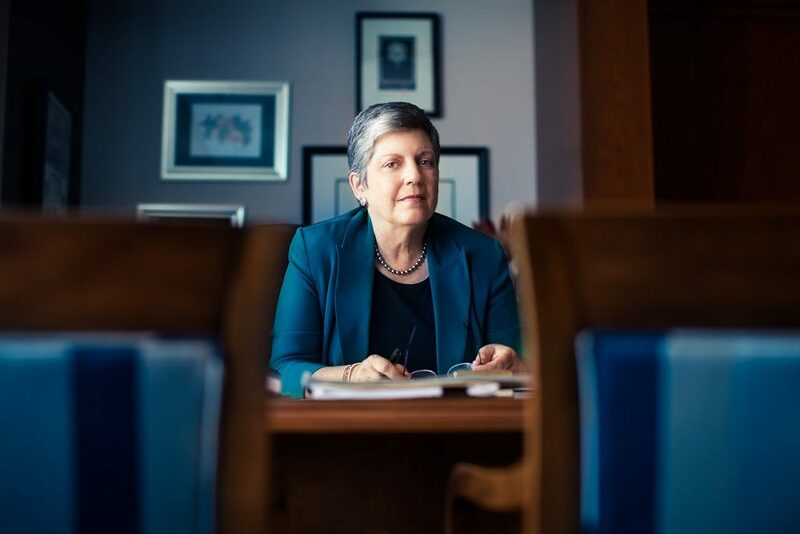 Napolitano is in an unusually visible position for a University of California president – and one that the regents could not have anticipated when they appointed her. Perhaps the last UC president to have anywhere close to her national prominence was the late Clark Kerr, who was attacked by then-Gov. Ronald Reagan for being too lenient on student protesters, and as a result was fired by the board of regents in 1967. At the time of Napolitano’s appointment, it would have been impossible to predict that Donald Trump would become the GOP nominee for president, let alone president, that immigration would become the major issue in the presidential campaign – or that Napolitano would find herself in a position of speaking out on behalf of thousands of University of California students who are thought to have benefited from the DACA program that she helped create. “We want their talents, their brains, their contributions to the country, so it makes no sense to subject them to deportation, and makes a lot of sense to give them work authority so they can go to school and work at the same time,” Napolitano said. Because of California’s size and the fact that it has a higher proportion of undocumented immigrants than any other state, young people from California are vastly overrepresented among those who have benefited from the program. Some 214,000 out of the 742,000 people nationally who received temporary relief from deportation live in California. Although there are no firm figures, an estimated 75,000 of them attend one of the 10 University of California campuses, 23 California State University campuses or 113 community colleges. After arriving at the university, Napolitano convened a national summit on undocumented students. She set up a $5 million fund to assist undocumented students attending the system’s 10 campuses. She helped create the Undocumented Student Legal Services Center, based at the UC Davis School of Law, and worked with Gov. Jerry Brown to create a loan program for undocumented students. Appeals to President Trump from many quarters, including directly from former President Barack Obama, to spare DACA students, seem to have had an impact. At his memorable press conference at the White House last week, Trump said “we will show great heart” to DACA students. For the moment at least, DACA students appear to have escaped the dragnet the Department of Homeland Security is setting up to deport potentially millions of undocumented immigrants, which could include many of their parents, friends and relatives. DACA students, however, are feeling far from reassured. Many feel vulnerable because immigration authorities know who they are and where they live. That could also put their family members at greater risk, even if they themselves are not deportable. They also fear being vulnerable for the most minor of offenses. The case of Daniel Ramirez Medina, a 23-year-old who got temporary legal status as a result of DACA, is also raising anxieties. Ramirez is being detained in Seattle and faces deportation for alleged gang ties — something Ramirez denies. On top of that, a Feb. 16 Los Angeles Times article, citing anonymous White House immigration policy advisers, describes ways the administration could terminate the program without explicitly revoking it. Against this uncertain backdrop, former UC student regent Flores said Napolitano must go even further to make the university she heads a “safe space and refuge” not only for undocumented students, but for their friends, family and the wider immigrant community. “Her background provides her with a platform and also a responsibility to speak out on these issues,” she said. Michael Collier contributed to this story. This story was updated to include information on memos issued by the secretary of Homeland Security on border enforcement and interior immigration enforcement. Ann, please provide a source and link for your fact. Thanks. Wish Janet would be champion for the tens of thousands of support and administrative staff employees she is responsible for.